The Q&A at the end of any author reading can sometimes be the best part of the reading. Sometimes, it’s the strangest or most awkward. A few weeks ago, at the Joan Didion reading in Washington, D.C., it was the most awkward. Most of the questions were personally probing into Didion’s life and relationships and feelings, I thought about this facet of being a writer—especially a nonfiction writer. One one hand, people ask these personal questions because, in your memoir, you have done an excellent job of translating your specific experience to the universal. They have been affected by what you have written, moved by it. And yet on the other hand, being a memoir writer apparently, to a lot of people, means that your entire personal life is fair game. Because you have done such a good job of putting your experience to the page, many people, it seems, think that all of your experiences, emotions, feelings, are fair game. Several people in the audience at Didion asked her very pointed, specific, personal questions: about her relationship with her son-in-law, about her feelings and emotions. It’s like they had an expectation that because she shared so publicly this one part of her life, every part of her life was up for public consumption. It’s a fascinating (and sort of uncomfortable) idea to think about as nonfiction writers. I dunno, do you think that these expectations are justified? I don’t, but I’d be curious about what others think. Have you had this same experience, either personally or at a reading? Share in the comments! Leslie Maxwell is a nonfiction editor at Phoebe. I admit I am still discovering Joan Didion, but lines like this make me wonder whu I waited so long. 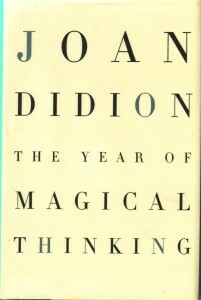 Though I’ve encountered a scattered selection of essays, when the night’s host and NPR correspondent Susan Stamberg asked for a show of hands of who had read Didion’s highly praised book A Year of Magical Thinking, my blue tinted palms remained guiltily in my lap. I finally delved into my first Didion book, Where I Was From, this year under the semi-duress of a class assignment. While I admired the utter precision and structural depth of Didion’s rumination on what it does and does not mean to be a Californian, my appreciation came at an emotional distance. My shelf may lack any well loved Didion books scribbled with commentary, but Didion has a reputation that ingratiates its way into the awareness of any invested reader, and when the opportunity arose to hear her speak, I did not hesitate to get a ticket. Where I Was From did not move me beyond clinical appreciation, but at its best moments, Blue Nights did. As Didion revealed that night, she set out to write the story of the years she spent parenting her daughter Quintana Roo, who died in 2005. After writing the first chapter she almost abandoned the book as a dead end project. Eventually she realized that the book wasn’t about raising children at all. It was about aging, and the loss felt by the living that accompanies mortality. Time passes, she writes again and again. For her daughter Quintana Roo, a name her and her husband John Dunne saw on a Mexican map, time passes for thirty nine years until she suffers complications from the flu and is confined to hospital ICU’s. She died within twenty months, not long after her father passed away. Didion writes about pressuring herself to “maintain momentum” to cope with the swift loss of her immediate family. Her often short responses and pregnant pauses made me wonder if she was not still on a mission to “maintain momentum.” She was sometimes forthcoming and more often not, yet I couldn’t help but respect how firmly she retained the division between what she was willing to discuss and what she wasn’t. When the polished Stamberg brought up aging, Didion simply replied, “It’s not my favorite subject.” Case closed, next question. Of course when you are a seventy six year old woman on your gazillionth book tour with a literary legacy authors drool over, you can draw the line where ever you please. 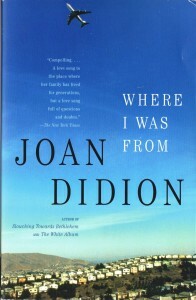 There were a few moments, however, when Didion shared her perspectives on the writing process with comparable clarity. Didion said finding the words for this book was not as easy it had once been. “What if I can never again locate the words that work?” she writes. 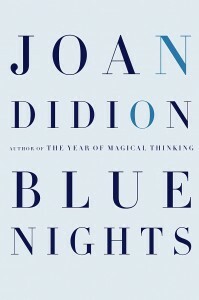 Didion said Blue Nights is more raw than her previous works, less edited. I would agree the book is raw, but more accurately honest, never catering to a reader’s desire for linear narrative, and often ignoring the third wall to address the reader directly. After recounting a fairly divergent story, Didion writes with nearly confrontational honesty, “I tell you this story just to prove that I can. That my frailty has not yet reached a point at which I can no longer tell a true story.” In fact this book is full of seemingly tangential stories, yet they don’t distract from a reading experience that retains its continuity. Didion articulated how she achieved this more clearly than I had understood myself. After hearing Didion speak for an hour, I still remain curious why Didion did not present Quintana as a more dynamic character, in the book or in person. Upon adopting Quintana, Didion recalls how unprepared she was for motherhood despite vehemently wanting a child. She saw her as a doll, a beautiful baby girl. Yet I wonder whether Quintana ever stops being a doll in Blue Nights. Even in the opening scene, Didion frames Quintana’s wedding day in snapshots that embody those rosy moments of childhood that anyone can cherry pick from the past. Isn’t the whole person ultimately more interesting, even if it takes longer to achieve? Isn’t there more to be understood about a person than the endearing moments of her childhood? There is plenty to learn from Joan Didion, both in the elements she executes flawlessly and those that left me skeptical. With a career of writing with immaculate rigor behind her, whatever literary choices she makes are surely intentional. And I doubt any explanation will be found in a question and answer session. As always, Joan Didion speaks to her readers most effectively in the text, which I’ll be returning to so the next time someone asks who has read Year of Magical Thinking, my hand will be the first in the air. Danielle Harms is a nonfiction reader at Phoebe.